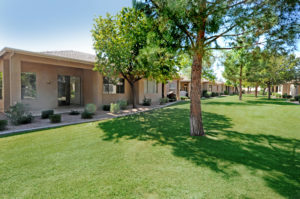 New Oakwood Country Club Listing-9630 E Rocky Lake Dr.
You are here: Home / Chandler AZ Real Estate / New Oakwood Country Club Listing-9630 E Rocky Lake Dr. 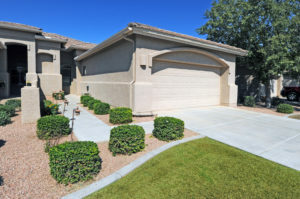 Enjoy living in a GREAT location near the Oakwood Country Club Clubhouse in Sun Lakes, AZ. This Portofino villa has 2 bedrooms and 2 baths with an open family and dining room. Lots of natural light shines in from the large picture windows to make this home bright and cheery. 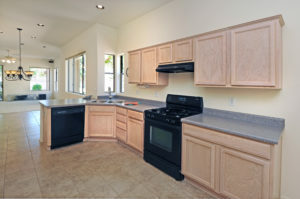 You’ll love cooking and serving meals in the spacious kitchen. There is plenty of cabinet and storage space. Plus, there is an eat-in area that can also be used for an office or desk space. Relax on your patio and enjoy the greenbelt, visit with neighbors or just have some time to yourself with a cup of coffee and your favorite book. And when it’s time to retire, the master suite features a walk-in closet, dual vanities and a new, Toto toilet. Outside, you’ll find a two car garage with attached storage cabinets and a new door opener in 2016. There are ceiling fans throughout and in the garage too. LOCK and GO, the separate HOA, takes care of all exterior maintenance and landscaping. And don’t forget the resort amenities! At Oakwood Country Club, you’ll enjoy: golf, tennis, pickleball, a heated pool and spa, a wourkout facility, a clubhouse/rec room, biking/walking paths, a gated community with on-site guard and concierge, and more! Hurry! This listing won’t be available long.